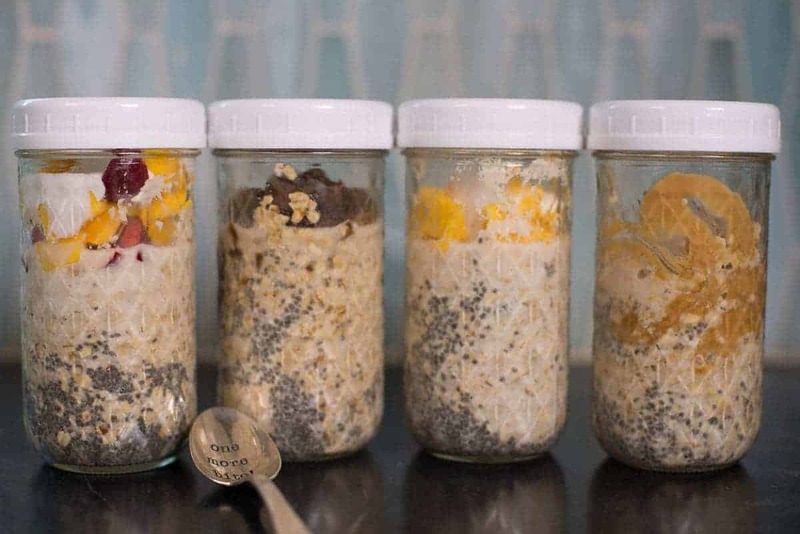 Why Overnight Oats Now? You Ask. I have to admit I can be a little retro. I still have roller blades that I use – if this gives you any clue. 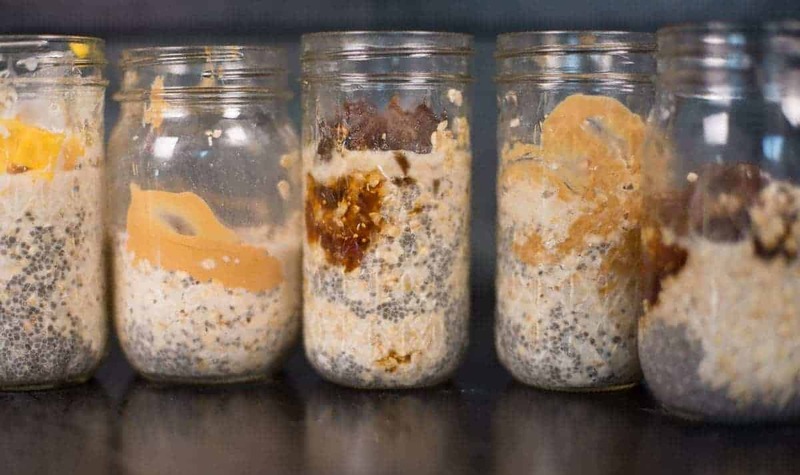 Back in their heyday, I wasn’t able to experience overnight oats because I was still deeply entrenched in my carb-fearing phase. Silly me! Now I am at a place where I am more interested in nourishing my body and building lean muscle than depriving my body of carbs. It felt like the right time to bring some oats back into my life. Why not start with these? These are seriously so good! And so good for you! I tried a few different flavor combinations. I am not sure which one was my favorite. I used the same basic formula for the oats and just changed up the toppings.
. The ones I used were too skinny and it made stirring the next morning a messy endeavor. One of the most important things that I have learned about carbs – we all need them. Women especially need them. Humans under stress really need them. If you want to build lean muscle you definitely need them. Carbs can get a bad rap because they are most often associated with all things sugary, sweet and highly processed. Those are things we all know that we want to avoid. Too mucc processed food and sugars can really mess with your hormones and natural hunger signaling pathways. The more sugary and highly processed food you eat, the more you’ll feel like you want to eat. Not surprisingly, the opposite is also true. The more you avoid these ‘bad carbs’, the easier it is to do it! 邏 Nerd Alert: Not all carbs are created equal, especially when it comes to grains. Oats (which are naturally gluten-free) provide a lot of easily digestible carbs. They keep you full for hours while giving you energy for whatever activities you’ve planned for the day. On the other hand – bread made with highly processed wheat flour are a very different kind of carb. Flour made from wheat contains high concentrations of gluten. Gluten is a lectin protein that can be irritating to the gut and cause inflammation. Oats – and even rice – are naturally gluten-free, containing lesser concentrations of these lectins. White rice is the most neutral grain for your digestive system. It is extremely easy to digest and very non-inflammatory. This is one of the reasons it is a popular first ‘solid’ food fed to infants. Try putting some oats into your dietary rotation and see how they make you feel. 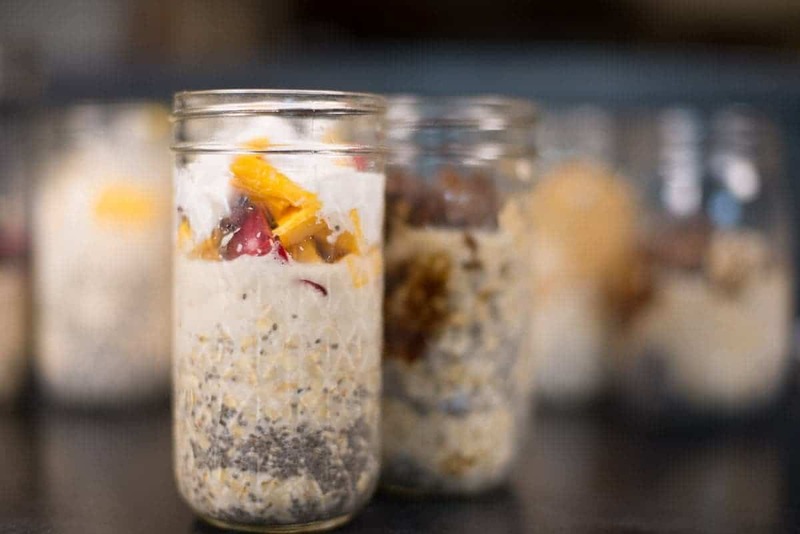 I find them to be a great source of energy – not to mention these Overnight Oats are a convenient grab and go meal. 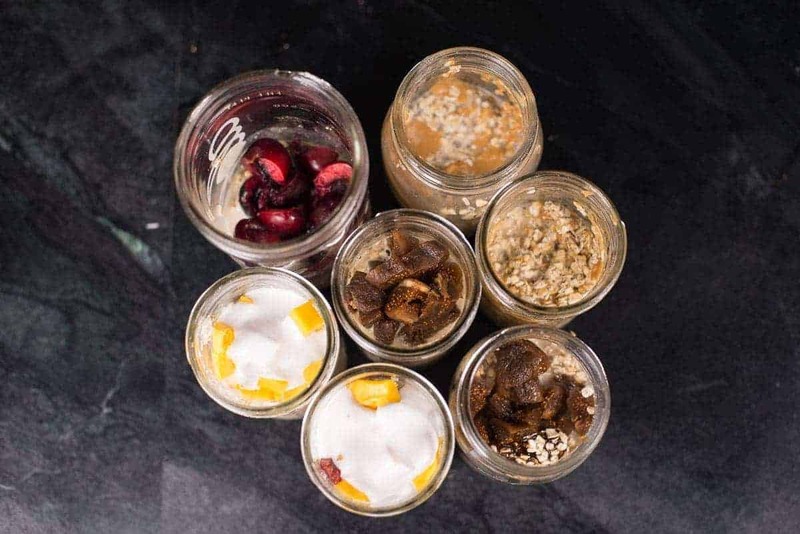 Overnight Oats Four Ways: These are delicious right out of the fridge or they can be warmed up. Stir in a few tablespoons of your favorite peanut butter. Stir in a few tablespoons of dried coconut flakes. Add chopped mangoes and them top off with coconut cream. Stir in a 3-4 teaspoons of fig jam and the chopped figs. Add chopped fresh cherries and slivered almonds. Pro Tip: Use wide mouth jars. The ones I used were too skinny and it made stirring the next morning a messy endeavor. Nutrition calculations are for the basic oats without toppings.